The Arizona House Commerce Committee will hold a hearing on HB2613, the bill to eliminate geologist registration in Arizona, at 9:30 AM, Wednesday, February 17, in House Hearing Room 1. Elimination of licensing of geologists would likely result in geologists having to get engineers to sign off on their reports to clients and agencies. ALERT**HB2613 Proposes to Deregulate Geologists and Landscape Architects. It also proposes moving the Board into the Arizona Department of Administration, the ramifications of which are unknown at this time. Please review the Bill; it may be heard in the House Commerce Committee as early as February 17, 2016 at 9:30 am. http://www.azleg.gov/legtext/52leg/2r/bills/hb2613p.pdf. Please look at sections 12, 13, 14, 15, 16, 17, 18, 19, 20, and Section 56, 57, 58. 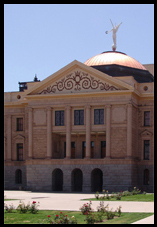 You can find your legislators' contact information at http://azredistricting.org/districtlocator/. You can contact the Governor http://azgovernor.gov/governor/form/contact-governor-ducey. The government always likes to change things so they look like they are doing their job. All they do is make things worse to be undone at a future date. Why undo a program and regulations that took years to refine and are working well? The registration of geologists in Arizona through the Arizona Board of Technical Registration (ABOTR) and, in part, using the Association of State Boards of Geology (ASBOG) exam is a model program often used by other US states and Canadian provinces/territories and others. It is a very fair program of requiring standards of expertise and education to become licensed. This is of benefit to the public and industries needing the services of a professional geologist. The current regulations are very clear on who needs to be licensed. Not all geologists have to be licensed or registered. It depends on the type of work the geologist is doing and is typically for those geologists dealing with geologic investigations related directly or indirectly with human health, public safety, and the environment. So, a message to the AZ legislators - keep the regulations for registering and licensing geologists as they are. They are working well and should not be relaxed or undone.